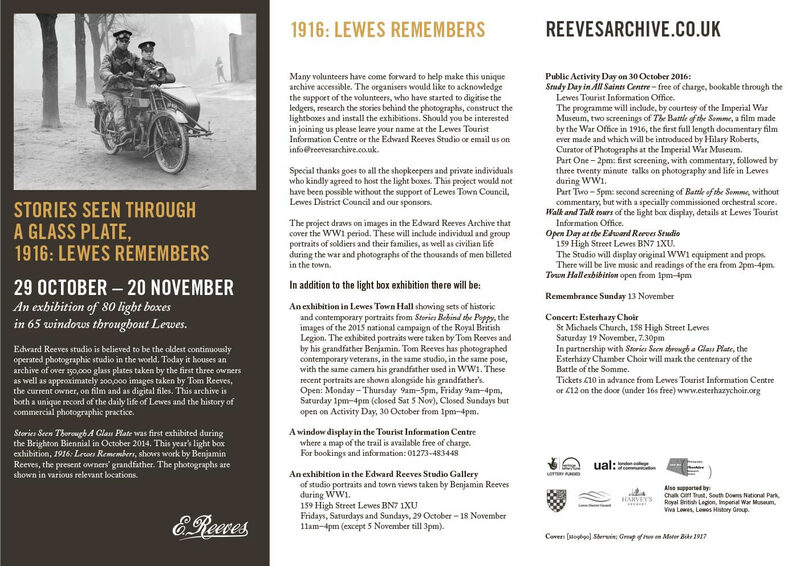 An exhibition of 80 light boxes in 65 windows throughout Lewes, 1916: Lewes Remembers showing work from the years of the First World War by Benjamin Reeves, grandfather of the present Reeves owner Tom Reeves. This includes individual and group portraits of soldiers and their families, as well as civilian life during the war, and photographs of the thousands of men billeted in the town. To help bring things to life, the photographs are shown around Lewes in locations relevant to their subjects. The Lewes Tourist Information Office can supply a free map of the light box trail, and an interactive version of the map is also available online.